There are powerful lessons in the way Susan Downing-White uses a muted palette and calming compositions to suggest peacefulness even in the roiling thunderheads of an approaching storm. She is an exceptional painter whose high-key palette and delicate, feathery brushstrokes capture the strong, diffused light found in humid, coastal tidal marshes. 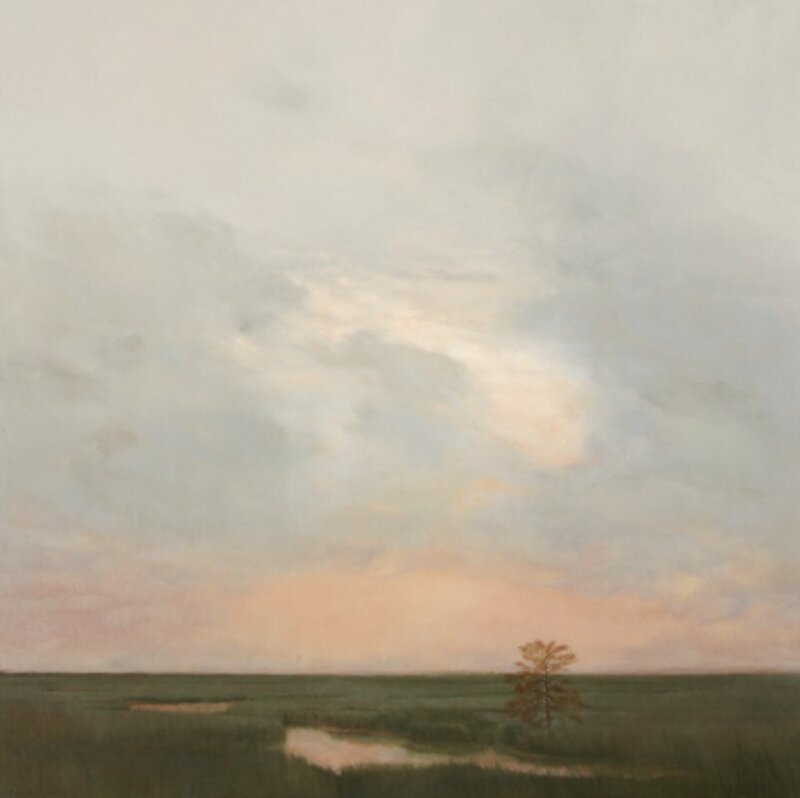 Downing-White always has a camera and sketchbook by her side to catch and collect images—a certain angle of marshland, a calm bayou, grass, trees, a heron quietly fishing, or dramatic clouds—for later use in her studio. When something catches her eye, she stops, takes photographs, or executes small drawings in her sketchbook with brief notations about color and light. “Photographs,” she explains, “are visual notes. It’s helpful, for example, to see how a stream curves through the landscape. I choose my subject matter intuitively. Although Downing-White has worked in pastel and watercolor, she prefers oil. “Oil paints are so beautiful,” she says. “I love the look, the way they smell.” She favors oil paints made by Holbein, Schmincke, Gamblin, and Winsor & Newton, but she prefers Rembrandt’s raw umber, Grumbacher’s greenish umber, and Williamsburg’s turkey umber. Her chosen shades of yellows and blues vary from painting to painting. Downing-White’s preparatory steps are pretty basic. She stretches her own canvases, preferring prepared Claessens type 13 double oil-primed canvas because of its gripping texture. Before drawing in the composition, she applies an underpainting of pigment thinned with Liquin, which dries quickly and locks down the first value. This imprimatura’s color depends upon the dominant colors in the composition; she often uses a Venetian red or raw umber, diluted in Liquin. Occasionally, as in The Details of the Journey, Downing-White continues the underpainting onto the frame with stream-of-consciousness grisaille sketches or words that may or may not relate to the painting. These sketches might be detailed or simply a ghost image of the painting. Early in her career, Downing-White worked with paints directly from the tube. She now mixes in a little medium to give the paint transparency and to help it dry faster. “I try to be methodical in my work but not too much,” she says. “I make the darkest values by using glazes rather than opaque paint. They seem more interesting that way. I want to keep the color—a glaze should not be so deep that it loses its color identity or goes to black.” Her glazes usually consist of 5 parts turpentine, 2 parts stand oil, 1 part damar varnish, and the desired pigment. “Applying glazes adds some transparency and permits the underpainting to show through,” she explains. “It looks rich and beautiful like stained glass.” Paintings take about two weeks to a month to complete, depending upon the weather and humidity. Once the paint is completely dry (usually a couple of months for thinly painted work), she applies two coats of varnish by brush. Her preference, one that she learned while restoring paintings in New Orleans, is a solution of 1 part Talas’s Acryloid (Paraloid) B67 crystals, 3 parts toluene, and 1 part mineral spirits. Each coat dries within an hour. She says it doesn’t yellow, it’s not too glossy, and it can be easily removed. In a way, Downing-White’s artwork—especially her iridescent marsh landscapes under storm clouds—calls to mind what famed magic-realist painter Andrew Wyeth once said about his own paintings: “I don’t want to be an artist strong in the picture. I am an instrument … I wish I could be nothing, just float over the woods and fields.” In Downing-White’s paintings, viewers float above the marshes and landscapes of her imagination. John Kemp is the author of numerous books and magazine articles on the arts and a deputy director of the Louisiana Endowment for the Humanities.